Young baseball players’ dreams are often realized when they are drafted by a Major League Baseball team. But for Stony Brook Baseball senior centerfielder Toby Handley, that dream is being put on hold. Handley declined an offer from the Houston Astros who drafted him in the 33rd round following his junior season in 2016. Despite the excitement of being drafted by an MLB team, his commitment to the Seawolves took priority. Handley is one of three seniors in this year’s class. Outfielder Casey Baker and shortstop Jeremy Giles have played alongside Handley since they were freshmen. The senior class has, as Handley put it, “unfinished business” this season, referencing the team’s defeat to Binghamton in the America East Championship in 2014 and 2016. He admitted the rivalry was a major factor in his return. “The rivalry is building. Revenge is a good theme for the season,” Handley said about Binghamton. “We aren’t going to take anyone lightly this season and hopefully we will get right back to ‘Brookball’,” a name the team has coined for its scrappy, small-ball style. 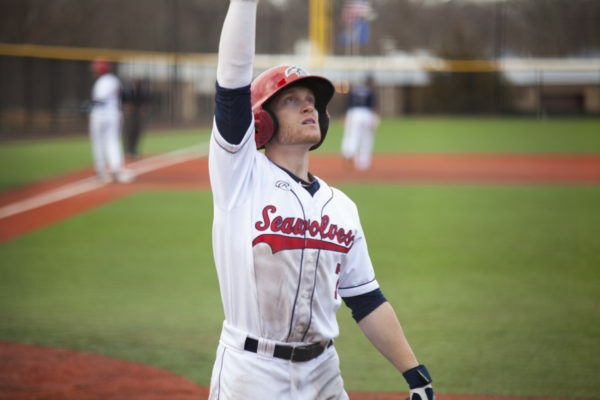 Handley garnered interest from MLB teams after three strong seasons as a Seawolf. He has a .297 batting average, 69 RBIs and 36 stolen bases across those three seasons, while displaying defensive mastery in centerfield. However, Handley’s numbers dipped somewhat last season, including a batting average drop from .330 in 2015 to .297 in 2016. Handley was not satisfied with his play in 2016 and his return was also motivated by his belief that he can improve, helping not only himself but also his team, while hopefully increasing his draft stock.